Mefenamic Acid Dolfenal officially introduced its latest campaign #LagingGoodVibes in an intimate media gathering earlier today at Vyne, W Global Building, Bonifacio Global City. The venue reaps of bright, warm hues that create the right atmosphere for good vibes. 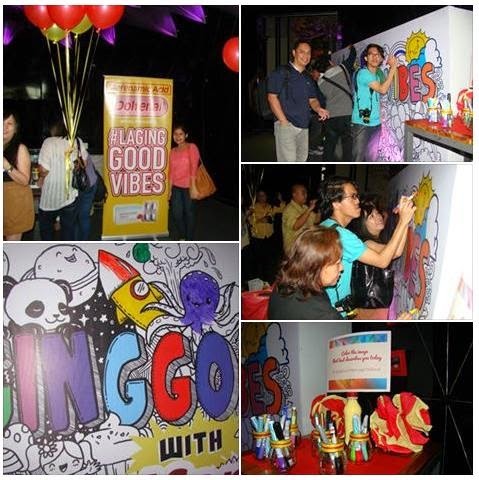 Colorful balloons and the LagingGoodVibes billboard welcomed guests at the registry. Visitors were invited to co-create the mural with a splash of colored pens. Guests met Dolfenal influencer Ashley Rivera aka Petra Mahalimuyak who led a dance session on “How to Dance with Dysmenorrhea,” featured on her first “How To” webisode. Another one of Ashley’s How To Videos – “How to Take a Selfie while in Pain” has garnered over 10,000 views with favorable reviews. It was an afternoon of fun and good vibes with free flowing candy care of Dolfenal’s Candy Bar, make your own Cucake Toppings and through different activities tackling the three pains Dolfenal targets – Dysmenorrhea, Toothache and Migraine. There was a Donut Eating contest face off between media and the Ogilvy team plus an hour of singing with a live acoustic band to showcase the fun vibes. Learn how to get #LagingGoodVibes with Dolfenal by visiting their YouTube channel at https://www.youtube.com/user/dolfenalphilippines. You may also get updates on https://twitter.com/dolfenalph.